We report a patient with chronic hepatitis C who developed eosinophilic enteritis while being treated with recombinant interferon α-2b. He had no history of either allergic disorders or recurring episodes of abdominal cramps, nausea, or diarrhea. He also had had a normal eosinophil count prior to the interferon treatment. After a 12-week course of interferon α-2b, he began to complain of severe abdominal pain, diarrhea, and abdominal fullness. His peripheral eosinophil count increased to 45% (absolute count, of 7610/μl). Abdominal ultrasonography and computed tomography revealed diffuse thickness of the intestinal wall with gross ascites that contained numerous eosinophils. 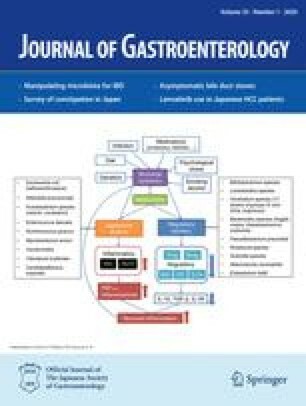 An upper gastrointestinal barium study with small bowel follow-through showed an edematous mucosal layer of the jejunum and ileum. There was a spectacular relief of the patient's subjective symptoms after the administration of prednisolone. Follow-up studies revealed resolution of the ascites and the mucosal layer edema and normalization of the peripheral eosinophil count. Prednisolone was tapered off, but the eosinophilic enteritis did not recur. As there had been no evident exposure to common causative factors for eosinophilic enteritis, we suggest that interferon α-2b could thus have played a role in the triggering of the eosinophilic enteritis.